Coach June Jones told the team in a subtle way that there will be no curfew or bed checks until later this week. NEW ORLEANS » No curfew. They're the two sweetest words an athlete on the road can hear. But with such freedom comes responsibility, and the undefeated Hawaii Warriors' self-discipline will be tested since there will be no bed checks until later in the week. Of course, staying out all night might not be a wise choice, since the team is getting ready for Tuesday's Sugar Bowl against Georgia with full days of practices and meetings, and also because there is plenty of potential trouble to get into in New Orleans. "Tonight and tomorrow there'll be no curfew," coach June Jones said last night, after the Warriors arrived here yesterday morning. "Most of the players have family here and they'll be doing stuff with them. They'll be fine." One concern is casinos. There is legal gambling within walking distance of the team hotel. All-American guard and team captain Hercules Satele said he's managed to avoid going to casinos at previous road games and doesn't see any reason to start trying his luck now. Not that the Warriors of legal age have been specifically banned. "(Jones said) try to stay away from the things we're supposed to stay away from," Satele said. "He mentioned it, but didn't really actually say it. I'm staying away from it. The whole season I've stayed away from the casinos." Georgia coach Mark Richt has told his players to not go to the gambling establishments. Upon arrival yesterday morning, the Warriors checked into their rooms and sacked out. Then most just walked around the city with teammates, friends and family, checking out sites like the Riverwalk Mall. They also received the second half of their $675 of expense money. The first team meetings were at 8 p.m., and a representative of the New Orleans police briefed the Warriors on staying safe. Manny Rezentes, the team's director of security, said the Warriors have had "three or four serious incidents" of misbehavior like fighting or theft in his four years on the job. None of them happened on the road, he said. "They weren't even pertaining to UH itself, (they were) off-campus things. For the amount of people, in four years, that's pretty good," said Rezentes, a retired HPD veteran of 27 years. "On the road, it's been even better. Nothing like that, just breaking curfew once or twice." Rezentes acknowledged that seven nights in New Orleans is different than, say, two nights in Lewiston, Idaho. "We have a town that's open all night. So after the meetings and stuff they can wander the streets. There's only a few nights with curfew, prior to the big game," Rezentes said. "(Jones) wants to treat them like men." The Warriors were scheduled for a 9 a.m. wake-up call today (6 a.m. for Jones and players who signed up for a Fellowship of Christian Athletes breakfast), and the first meeting was at 9:30. The first practice for the New Year's Day game against the Bulldogs was set for 2 to 4 p.m. at the Saints' practice facility. Junior slotback Ryan Grice-Mullins, a speech and communications major, has joined the blogosphere. 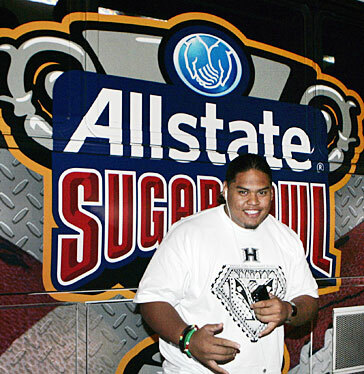 Grice-Mullins is writing daily reports of his Sugar Bowl experience as part of an internship with the UH media relations department. "It's pretty cool. It's good to let people know what's really going on. It's all me, how our trip is really going," Grice-Mullins said. "It's not about a grade, it's for the fun, and letting people know what it really is." While much of the talk about New Orleans has been about how much fun and how dangerous the city can be, senior linebacker Brad Kalilimoku doesn't forget what happened here two years ago. "It's a real historical place. It's interesting seeing the lifestyle and the struggle they're having coming back (from Hurricane Katrina). It helps you to appreciate the things you have because you don't know if one day that will be taken away. This place means a lot," Kalilimoku said on the evening of his first day in the city. "I want to go on a tour and see the areas that have been affected by the hurricane and flooding." The Warriors' latest itinerary lists a hospital visit on Saturday as the only non-football or meal-related activity for the week. But Jones said other excursions are being planned. Hawaii fans in New Orleans attending the game will be able to get a free fan and ti leaves to help the Warriors in their game against Georgia. The fans and ti leaves will be available at the Marriott New Orleans on Canal Street on Dec. 30 and 31 and Jan. 1, as well as at the Superdome on game day.